Information technology has been an in-demand field for years, and mobile applications are at the forefront of current technology. Whether you are simply a fan of app-based entertainment or want to help businesses build more effective applications for internal or external use, the possibilities in Mobile Application Software Engineering and Programming are numerous. You can find employment in most industries or explore self-employment through the development of your own applications. Before beginning any Associate’s degree program, you will need to obtain a high school diploma or its equivalent. Other requirements may be set by the school to which you apply. 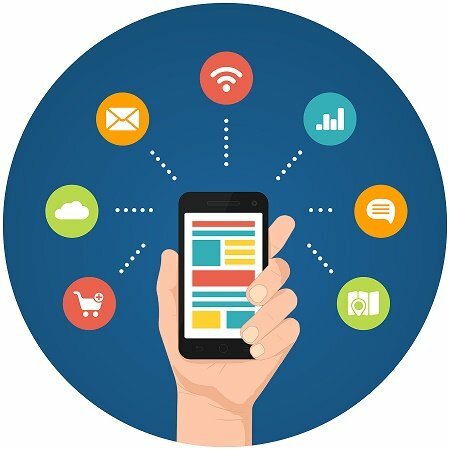 To best prepare yourself for a career in mobile application development, it is important to focus your high school studies in computer science and other technical courses whenever possible. Math can also be a useful subject for those interested in technology careers, as well as art for learning about aesthetic qualities that will be involved. Since these degree programs often have core educational requirements, don’t neglect other key areas like English, history, and science. Not all high schools can support classes focused on programming languages. If your school does not offer applicable classes, consider some self-study to familiarize yourself with the main concepts. Often, learning your first programming language is the most difficult regardless of which you choose. Once you are comfortable with the basic structure of a language, it is simpler to apply that knowledge to learning a new language. By dedicating time now to develop your programming skills, you can ease your transition into college-level coursework. A variety of soft skills are also useful for technical degrees. Organizational skills can make project planning efforts simpler, while communication skills will help you operate more efficiently in team-oriented workplaces. A major part of applying to colleges is completing any financial aid requirements. If the educational institution is able to accept federal financial aid, you will need to complete the Free Application for Federal Student Aid (FAFSA) and have the results forwarded to your schools of choice. Based on your FAFSA information, it will be determined if you have access to individual programs, such as Pell grant funds or federal student loans. Individually schools have no say regarding this eligibility. Many colleges have additional financial aid options beyond those provided through the completion of your FAFSA. Schools may have additional scholarships or grants available to students who qualify. Some awards are need-based and may require additional applications and proof of income. Others are merit-based and may be granted based on your past academic performance. External organizations also offer scholarship opportunities. Each relies on its own set of requirements, and additional applications are typical. You can find funds based on the degree plan you intend to pursue as well as offerings reliant on your association with specific groups. If you do not qualify for financial aid or require funds beyond what has been awarded, you have additional options available. Private student loans can fill the gap between other awards and your remaining tuition or you may qualify for a payment plan offered by the school itself. You also always have the option to pay for classes outright, if you have the available funds. The availability of courses is set by the educational institution. Most colleges offer traditional day programs, though some offer evening, weekend, and online class options. If you have specific scheduling limitations due to other obligations, then it is important to find a school that has a program that suits your needs. Additionally, some colleges have a more rigid format than others. For example, a school may require all students in a particular program to take the exact same classes in a precise order. Others will offer a level of flexibility as long as certain classes are completed before attending those that have a class as a prerequisite. Since an Associate’s degree includes core course requirements and may involve electives, you might have options regarding some of your class choices as long as you complete enough credits in each category. This allows you to personalize your experience as long as they courses fit into your overall graduation plan. Often, advisors are available to help determine which courses will work best for your degree and schedule. Once your schedule is set, you will need to attend classes to work towards your degree. Coursework will cover a range of subject with particular emphasis on classes that support your chosen major. Classes that are attended in-person will have set expectations regarding attendance. Online courses may have more flexibility as long as key objectives are met by specified deadlines. Failure to meet attendance standards, if they are set by the instructor or institution, can result in lower grades even if the rest of your classwork is completed correctly. However, it is important to complete all required work in a timely fashion even if specific attendance requirements are not in place. Most Associate’s degree programs are designed to be completed in approximately two years, though this can vary depending on the standards of the school that you choose to attend. Additionally, those taking programs entirely during the evening or weekends may require more time to finish all of the coursework depending on the class offerings for the non-traditional schedule. For those who can manage a heavier than usual course load, you may be able to graduate in less than two years. However, individual colleges may limit this option at their discretion. General education requirements provide a foundation to help students succeed in college, as well as in the workplace. Most schools require specific amounts of English, math, science, and other subjects regardless of your chosen major. However, you may have a selection of courses available that meet the requirements. Classes focused on your major will provide you the skills necessary to excel in the field. Most mobile application software engineering and programming degrees require multiple programming languages, such as C# and Java. You’ll also be introduced to technique specific to the Android, iOS, and Window Mobile SDK. While some of the coursework focuses on computer-based programming, all of the skills can be translated to part of the mobile application development process, as many of these programs are first developed with a computer even if they are designed to work on smartphones, tablets, and other mobile devices. There is a shortage of available IT workers, and it is no different for those who focus on mobile applications. The field is expected to expand significantly faster than average growth when compared to all other career options available in the country. As the use of apps becomes more common for all kinds of businesses, the opportunity to find work expands across most industries. You can choose to focus your efforts on a particular sector, like healthcare or banking, or choose a more general approach. Additionally, you can opt to focus on entertainment apps, such as games and video streaming, if that is where your passion lies. Certain positions may be more competitive than others, but the field, in general, is going to be in high demand for quite some time. Mobile application software engineers and programmers can work from almost anywhere, as long as they have access to a computer and suitable network connection. Your work environment may vary depending on the industry in which you find employment. Most developers will find themselves in office environments, even if it is an office within a larger industrial workplace. However, the work also lends itself well to remote-worker opportunities. This means you may be able to find employment that allows you to work from home or any location that supplies reasonable internet speeds. Since the job can be performed for almost anywhere, it can be an attractive option for those interested in telecommuting opportunities with a single company. It can also be profitably for freelance and contract work, allowing you to work on a diverse range of projects simultaneously. The majority of developers work full time, and traditional day shift hours are typical. However, long hours can be required depending on your job environment and expectations of your employer. Those who work for government agencies may find their hours are more set, while those working for large corporations may not. Additionally, those working as freelancers may be able to control their schedule based on their needs and the projects they choose to accept. It is important to factor the scheduling requirements in before accepting any position, especially if you have other obligations that must be met. Individual employers may provide more flexibility than others, so make sure to ask before selecting an employment offer. For those who find employment with individual businesses, you will discover the pay rates are generally competitive. While precise numbers are not entirely tracked, considering the relative newness of the specialty, it may be comparable to web or software developers, who earned a median annual salary of $64,970 and $98,260 in 2015 respectively. Full-time employees are traditionally offered comprehensive benefits packages. These can include, medical, dental, and vision insurance, as well as retirement options. Paid time off, including vacation time and sick leave, are also standard offerings. Additional perks may also be offered, such as educational benefits or employee discount programs, depending on the organization. Those who choose to be self-employed may have a difficult time predicting their income. However, as experience and notoriety increase, wages often increase accordingly. You will also be responsible for maintaining your own health insurance and will need to set up an individual retirement plan. Additionally, you will have to track your taxable income and make quarterly payments as required by law. With demand for skilled IT workers growing, the availability of advancement opportunities will likely be notable. As you gain experience working in the field, your skill set can command higher wages. If the shortfall of available workers continues as predicted, higher salaries and more enticing benefits may become more commonplace. If you want to advance more quickly, you can pursue a higher level college degree to increase your opportunities. While obtaining an entry-level position with an Associate’s degree is perfectly reasonable, you can choose to continue your studies to increase your marketability. Many software developers ultimately acquire Bachelor’s degrees, while some decide to pursue a Master’s. While advanced degrees are not required for all positions, they can make it easier to receive promotions and may lead to management opportunities. Continuing education outside of traditional degrees is also valuable. Different programming languages present themselves regularly, and new tools and techniques streamline programming efforts. By taking the time to stay abreast of industry developments, you can position yourself as an expert in the field throughout your career. Consider acquiring professional certifications offered in the area of mobile development provided by organizations like Microsoft, Oracle, MTA, or MDI. You can also certify in specific programming languages or on individual platforms, like Android and iOS. By staying current on developments in the mobile application field, you can build yourself a foundation for a long and prosperous career.